Sensing the warmth of spring, sometimes a butterfly emerged during the dead of winter from a pupa brought in unknowingly with the firewood. The First Nations believed it was a sign of the souls of relatives returning from the dead. If a butterfly landed on you it was good luck. If you whispered wishes to a butterfly when released, it carried them to the gods for granting. Imagine the beauty of the untouched Canadian wilderness 200 year ago. The variety of species was incredible. The variety of habitats: Great sand plains, Carolinian forests, Oak Savannahs, Prairie grassland and Wetlands. Butterflies marked the seasons with migration and hibernating in the fall and reappearance in the spring. They haunt fields and forests, sipping nectar from the blossom cups. The moth is a close relative but they love the night. Butterflies are found everywhere in the world except Antarctica and in all types of habitats. The attractive and beautiful daytime fliers are remarkable for their delicacy and the beauty of their wings which is a membrane covered with scales like shingles on a roof. Metamorphosis is an amazing phenomenon. It is the best-known insect transformation. The life cycle from egg to adult has long puzzled scientists. From eggs to small snake-like creatures which shed their skins, caterpillars feed and molt four times before they are ready for a wonderful transformation. The quiet chrysalis miraculously produces a butterfly. It is no wonder we’ve tried to make them a permanent sight by placing them in our home decor and on quilts, and now the Carruthers Barn on Longwoods Road! 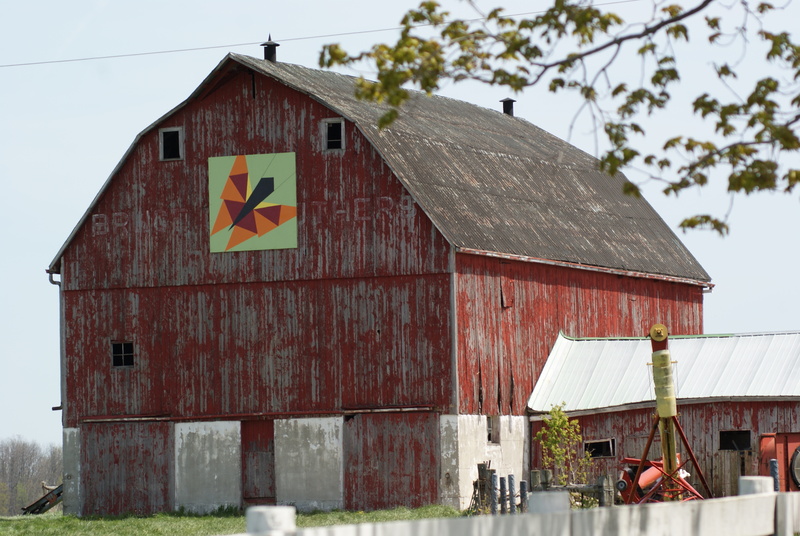 Posted on June 8, 2012, in Longwoods Barn Quilt Trail and tagged butterfly. Bookmark the permalink. 1 Comment.